5000 BC: Unknown human stumbles across a burning cannabis bush, inhales, and thinks he’s talking to God. 2700 BC: Shaman is buried with cannabis in the Gobi Desert. Earliest positive proof of humans using cannabis for psychoactive purposes. 1500 BC: Cannabis is used medically in Egypt. 600 BC: Zoroaster, the Persian prophet, lists 10,000 medicinal plants in his book Zend-Avesta, but cannabis is #1. 70 CE: Romans begin using cannabis for medicinal purposes. 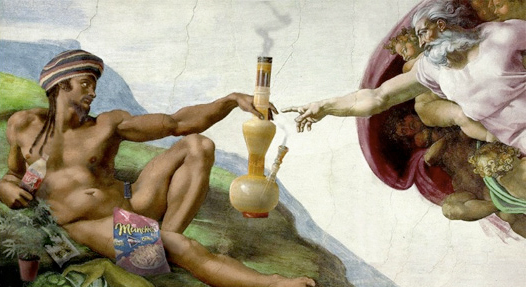 170 CE: Romans are now making edibles from cannabis seeds and getting high from them. 800: Arabs begin using cannabis. 1484: Pope Innocent VIII bans cannabis use. 1619: First law in America concerning Indian hemp (Cannabis indica). Growing cannabis becomes mandatory in Virginia. 1776: The Declaration of Independence is drafted…on paper made from hemp. 1841: Scottish doctor William O’Shaunghnessy writes about medical use of cannabis after learning about it in India. 1870: The U.S. Pharmacopoeia, the official list of medicines, lists cannnabis. 1883: Hashish smoking parlors become popular in every major U.S. city. 1906: U.S Pure Food and Drug Act, among other things, requires medicine containing cannabis to list it on the label. 1937: Marihuana Tax Act effectively outlaws both hemp and cannabis, which has suddenly gained the name “marijuana”. 1941: Cannabis is dropped from the U.S. Pharmacopoeia list. 1943: The U.S. Government encourages farmers to grow hemp again, because the fibers are important for the war effort. 1944: New York Mayor LaGuardia doesn’t believe the U.S. Government line and convenes his own commission on marijuana, which comes to the conclusion that it’s mostly harmless but may have useful medicinal properties. 1963: President John F. Kennedy decides to make marijuana legal in his second term, but is assassinated. 1964: Bob Dylan turns the Beatles on to marijuana and the Sixties officially begin. 1971: President Richard Nixon declares the War On Drugs. 1972: President Richard Nixon convenes his own commission on marijuana. The Shafer Commission comes to the conclusion that it’s mostly harmless and should be legalized again. Nixon ignores his own commission and attempts to cover up its report. Consumer Reports magazine comes out for legalization of marijuana. 1973: Creation of the DEA. 1974: A Medical College of Virgina study finds that THC slows the growth of cancer cells. DEA covers up results. 1976: The Federal Investigational New Drug Compassionate Access Program begins supplying marijuana cigarettes to about a dozen patients (a program which continues to this day) for medical reasons. 1990: THC receptors are discovered in the brain. 1996: Californians pass Proposition 215, allowing the legal use of marijuana for medical purposes. 2003: The U.S. Government awards itself a patent on the medical use of cannabinoids. 2005: The U.S. Supreme Court decides that the Federal government can ban marijuana even when it does not enter interstate commerce. 2011: Congressmen Barney Frank (D-MA) and Ron Paul (R-TX) introduce the Ending Federal Marijuana Prohibition Act of 2011. A total of 16 states, plus Washington D.C., have legalized medical marijuana. Previous articleRI Movers and Shakers Speak Up!!! Many Many Uses from the days of time.